You’ve meal prepped some grilled chicken breasts, roasted three different types of veggies, and wash and dried fresh berries from the farmer’s market. So healthy, right? Hold it right there. What are you storing your food in? Plastic containers and baggies? Let’s take a closer look at that. There is no denying that plastic products have made transportation of good-for-us (and maybe some not-so-good-for-us) items a whole lot more convenient. But, recent research and media attention have been brought to the harmful chemicals in plastics that can leach into our foods and drinks. The most notable chemical is BPA which has received beaucoup media attention lately for its role in disrupting hormone balance and causing weight gain, but unfortunately, BPA free doesn’t mean it’s any better. Its replacement, BPS, has been shown to be just as harmful. Phthalates are also highly present in plastics and have been known to be especially dangerous to men and boys as it can reduce testosterone, play a role in infertility, and suppress the immune system. That’s only the harmful part to our bodies. Our planet is also suffering from the use of our plastics in landfills, the oceans, and marine species we eat. Some facts for you: 1. A single plastic bag can take 1,000 years to degrade in a landfill; 2. Plastic bags are the second most common type of ocean refuse; and 3. The U.S. goes through 100 billion single use plastic bags per year. Stasher Bags are a favorite of the B+YND Team for transporting anything and everything, the sustainable way. Here are four ways that you can pack a lunch that's safer for you and better for our world. 1. STASHER BAGS: THESE REUSABLE, WASHABLE, MICROWAVABLE BAGS ARE MADE FROM SILICONE. THEY ARE NON-TOXIC AND ABLE TO BE RECYCLED. DID WE MENTION THEY'RE MICROWAVABLE? HOW COOL IS THAT? CHECK THEM OUT HERE. 2. LUNCHSKINS: THESE REUSABLE PAPER BAGS ARE 100% PLASTIC-FREE, TOXIN-FREE, AND COMPOSTABLE. THEY CAN BE REUSED A FEW TIMES BEFORE RECYCLING. AND THEY COME IN SOME FUN DESIGNS, TOO! LEARN MORE ABOUT LUNCHSKINS HERE. 3. PYREX CONTAINERS: THIS IS OUR PERSONAL FAVORITE FOR PACKING A SANDWICH BECAUSE IT NEVER GETS SMOOSHED (KNOW WHAT I MEAN?!). 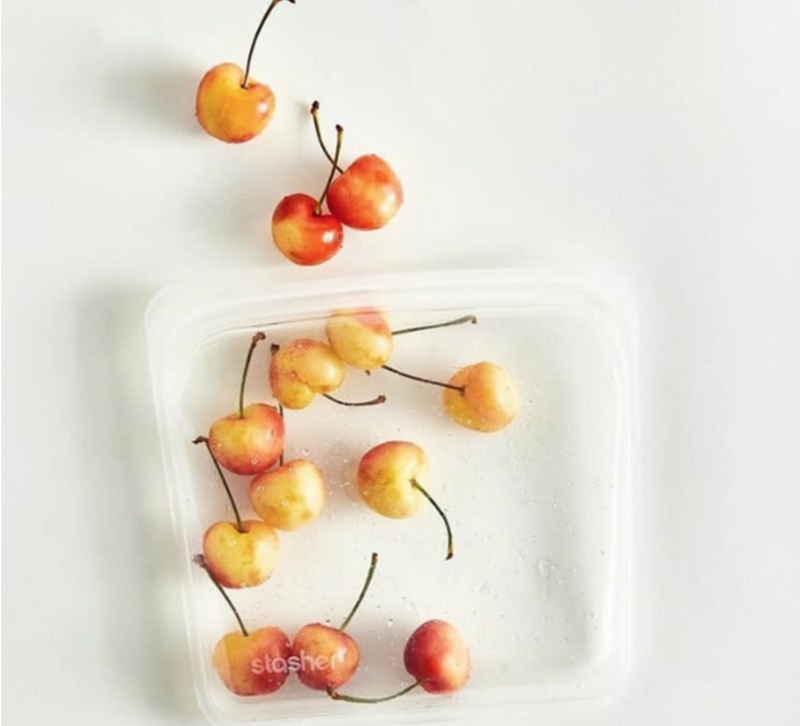 GLASS CONTAINERS ARE THE BEST ALTERNATIVE TO PLASTIC FOR STORING LEFTOVERS, BRINGING BERRIES TO WORK (ALSO EASILY SMOOSHABLE), ETC. AGAIN, PLASTIC CONTAINERS CAN LEAK TOXINS INTO YOUR FOOD, SO SWITCHING OUT ALL OF YOUR PLASTIC FOR GLASS IS A GREAT IDEA. 4. STEEL WATER BOTTLE: BOTTLING YOUR OWN WATER IN A REUSABLE STEEL CONTAINER KEEPS DISPOSABLE PLASTIC BOTTLES OUT OF LANDFILLS AND REDUCES THE CARBON FOOTPRINT THEY LEAVE WHILE ALSO KEEPING HARMFUL CHEMICALS OUT OF YOUR BODY. NOT TO MENTION THE COST SAVINGS FROM NOT HAVING TO BUY IT EVERY TIME YOU’RE THIRSTY (LOOKING AT YOU $6 AIRPORT BOTTLED WATER). While it might cost a little more on the front end to switch from plastic containers to the suggestions mentioned above, the long-term cost, health and environmental impacts are well worth the money. Let us know how you reduce your use of plastics, we’d love to hear your ideas!